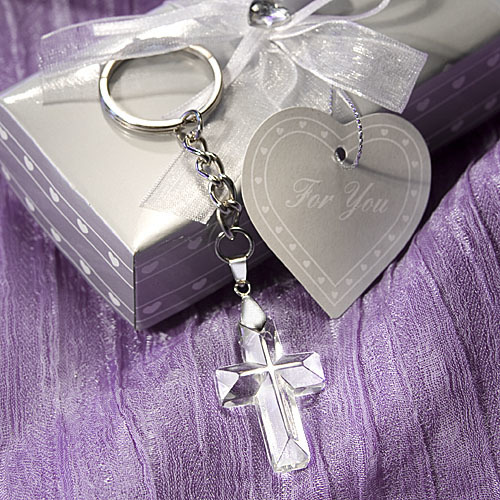 Give your guests a spiritual remembrance of a blessed day with these practical and elegant key chain favors. Each crystal cross key chain measures 4.25" x 1" x 0.5" and features a radiant, multifaceted luminous crystal cross charm attached at its top to a sturdy chrome chain and ring. Surrounded by satin inside a Choice Crystal signature gray heart design box, tied with an organza and satin bow with a crystal heart on top and an attached matching heart shaped tag, these favors make for a stunning presentation.